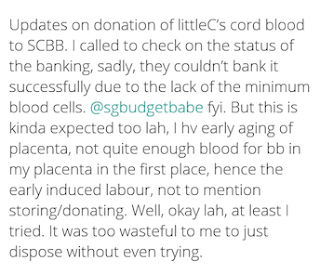 SG Budget Babe: Should I store or donate my baby's cord blood? Should I store or donate my baby's cord blood? 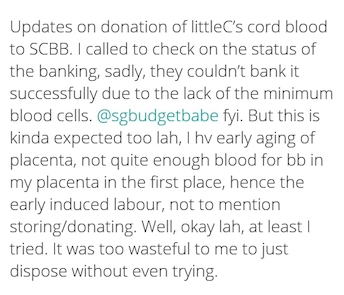 This is a follow-up post to my previous article here on whether cord blood banking is necessary, and one that has been highly requested by many of you who can't decide whether to donate or store your baby's cord blood privately. This is a pretty debatable issue and there's a wide range of opinions on this topic. 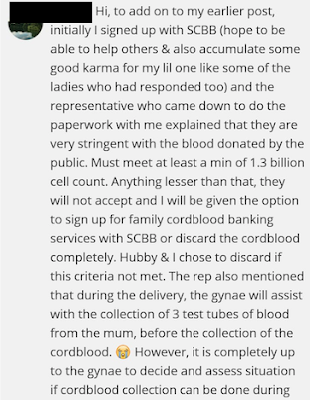 While my gynae encouraged it, I've also heard from readers who believe that it'll be better to donate rather than to pay a fee to store one's baby cord blood privately. Feeling lost, I turned to the ever-supportive community of mummies on Dayre (#dayremummies), and sought their advice on what they had chosen to do for their child(ren) when they were born. 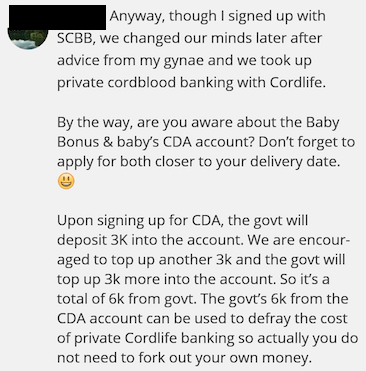 Some said they banked it privately (most mentioned they did it with Cordlife), but a significant number also told me that they chose to donate their baby's cord blood to the public bank, Singapore Cord Blood Bank (SCBB). 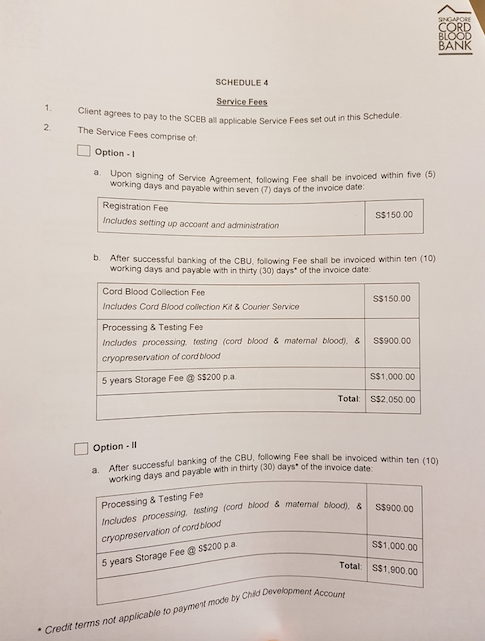 There is basically no charge to donors for the collection and banking of cord blood with SCBB (so you don't have to foot a single cent for the processing and cryopreservation), but as a result, it will be publicly available and no longer the property of the parents or the child. 1. If your child develops a genetic disease, it is unlikely that you can use the cord blood cells anyway since those stem cells will also contain the same genetic defect. This is somewhat true, but not all conditions that can be treated with hematopoietic stem cells are due to genetic reasons. For instance, while some diseases may indeed be inherited, not all cases are due to genetic disorders either even for the same type of disease (such as leukemia and lupus, etc). Here's some cases locally in Singapore where the child's own cord stem cells, stored at birth, came into usefulness for treatment later despite him being born with cerebral palsy. Internationally, there are more of such cases, including here (acquired brain injury from a fall), here (autism) and here (neuroblastoma). 2. If your sample is not used by anyone else, it will be stored without you having to pay anything and you'll be put on the priority list to use it later if your need arises. Although this is true, the problem is that there is no guarantee your cord blood stem cells will still be there when you need it, as no one knows what the future holds. 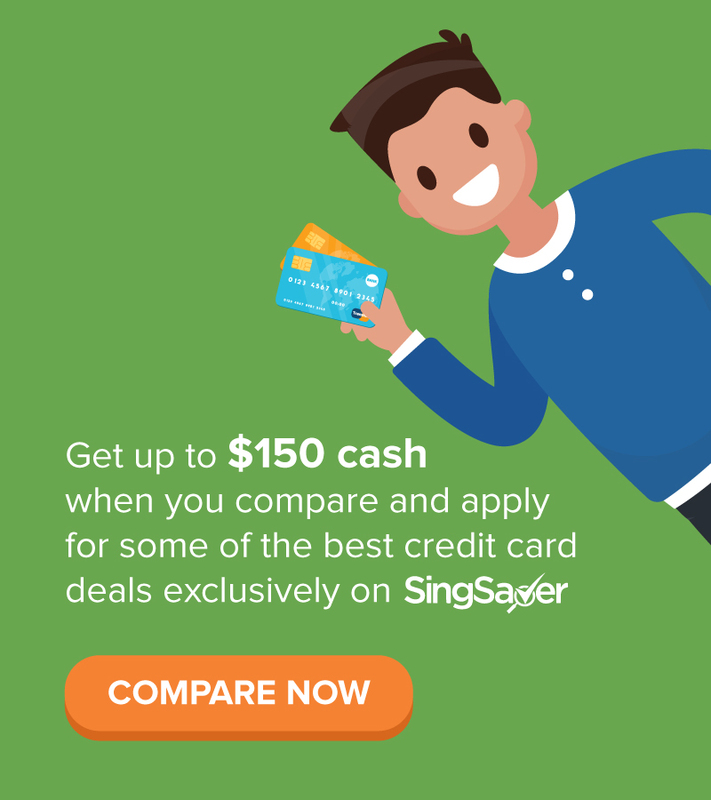 The public bank is open to patients not just in Singapore, but those all around the world who are searching for a match as well. There is therefore no assurance that your cord blood unit will still be there for your family when you need it. 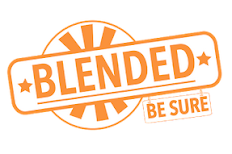 "SCBB manages both donors and non-donors in the same manner. If a donor's cord blood unit is still in storage at that time, it will be available for the patient who benefits most from it; this could be the donor or someone else." "Public cord blood banks, such as the SCBB, do not reserve any cord blood units for the specific family's usage." As you can see, it seems like majority weren't successful, therefore reaffirming my belief that it might be better to store privately instead of having it go to naught like this. 3. If your sample is not viable for storage, you can also opt for SCBB's conversion program for family banking and store it privately. This is a fairly new initiative launched by SCBB (in Feb 2018), so it wasn't available to parents who donated their newborn's cord blood previously. Basically, SCBB has relatively high requirements - for a viable donor sample to be accepted, it needs to contain at least 1.3 billion hematopoietic stem cells. However, if the cell count falls short and your baby's cord blood gets rejected, you can also opt for their conversion program where you store it in their family bank. The minimum for this private storage will then be 400 million stem cells. Costs wise, we spoke with SCBB and were told that it'll cost us $1,900 for the first 5 years, and $1,000 for every 5-year block thereafter. In other words, it'll cost $4,900 if we wish to store with SCBB for 20 years, which works out to be pretty much the same as what it'll cost us to bank with one of the private banks right from the start. 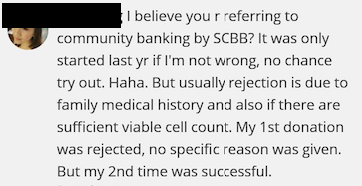 Costs verified again with SCBB by another reader, shortly after I spoke with them. 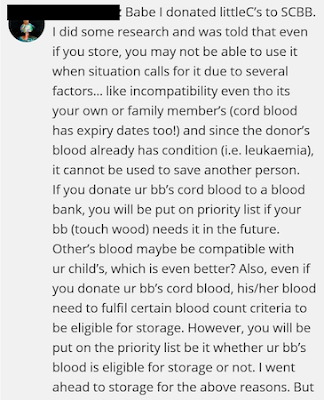 Another question that I had was : is it still feasible for me to do delayed cord clamping if I donate the cord blood? 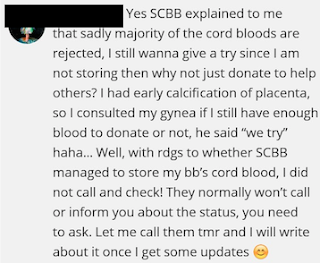 When I asked the SCBB representative as to whether delayed cord clamping could still be done in tandem with cord blood collection, she said no, as it reduces the blood volume and therefore the number of stem cells left is unlikely to be viable for donation (1.3 billion cells) and/or storage. However, the private banks told me differently, as their requirements are much lower in terms of the cell count (200 million minimum). Minority groups (or those who are ethnically-mixed) have a much lower chance of finding a suitable match through public cord blood banks. Therefore, if the price tag isn't too hefty for me to store it privately, I'd rather be guaranteed of an option for my child and my family instead of relying on the odds in the public bank, where the odds of a match is much lower. I'm currently finishing up my comparison table between the three private banks, and will share that in a subsequent post once I'm done verifying the data and facts. At just $5,000 to store my baby's cord blood till they reach age 21 (or just under $20 a month), I honestly think that's a small price to pay for a form of insurance that not only protects, but can potentially even treat or cure the condition. Name me any other insurance policy that does that! You obviously went through a bit of research. Have you come across anyone who successfully used privately banked cord?and for what indication? If cells are too small for public bank,would storing a smaller numbers of cells be clinically useful? May not be enough anyway and that’s why the cutoff for public banks. You mentioned that minority ethnic groups should privately bank. Actually that is the group that should publically donate as it can do the most good in helping someone. 1. You obviously went through a bit of research. Have you come across anyone who successfully used privately banked cord?and for what indication? --> I know OF people, but as for friends, no. You must also note my age group and life stage - many of my older friends did not bank as it was either not available back during their time when their kids were born, or they chose not to, and for the friends who are around my age range, they've either banked / donated / thrown away and it is too soon to tell. But I do know someone who has seen quite a few cases in their line of work where privately banked stem cord cells have come into useful. Again, I'll emphasize you're banking on the future - just like insurance. 2. If cells are too small for public bank,would storing a smaller numbers of cells be clinically useful? May not be enough anyway and that’s why the cutoff for public banks. 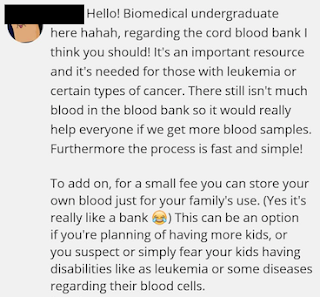 --> from what I know and have gleaned during the course of my research and speaking with various professionals, including those in the medical sector and private cord banks, that's because public banks have stricter requirements when it comes to using donated samples for someone else. I would also reckon you'll need more because a portion needs to be tested for recipient suitability as well, something which you don't need if you're banking for your own child since it is their own DNA in those cells. You can think of it in the same vein as blood donations - when u donate to family vs to stranger, which has stricter requirements? 3. You mentioned that minority ethnic groups should privately bank. Actually that is the group that should publically donate as it can do the most good in helping someone. --> yes if (i) they place the importance of everyone else's needs in their ethnic group above their own (ii) and/or they cannot afford to bank privately. I'm all for donating IF the alternative is to throw away. If you're in a minority group and can afford to bank privately, would you donate considering how the cord blood unit will be made available for the patient who will benefit most from it (be it the donor or someone else)? Imagine if you donate (vs bank when u could) thinking that it'll be there when your child needs it in the future; a few years down the road you try to retrieve it, but you're told that someone else has already used it / is using it because they have a greater need than you, and you're left with no stem cells for your own child even though that sample was yours. Public banking does not guarantee your donated unit will still be there when you need it. 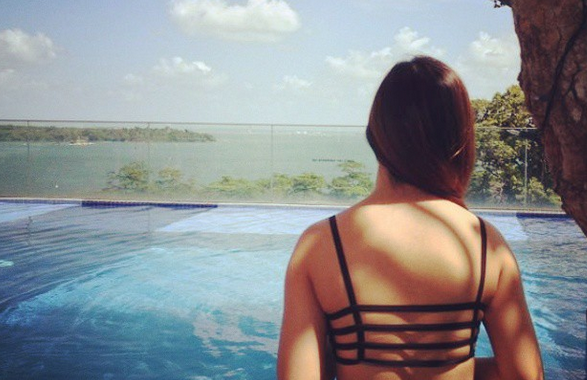 It is the reassurance and emotional trade-off that you have to consider as well. Call me selfish, but I'd rather bank my own child's cord JUST IN CASE he ever needs it in the future, vs donate it. If my choice was between throwing it away or donating it, then yes I would donate, but that's not my situation right now. Do we need to pay anything if choose to donate the blood cord? I remembered when I briefly browse through the brochure, it seems like we need to pay for all those test if the blood cord is qualified to be donated. Hi, I'm not sure about this, good question! 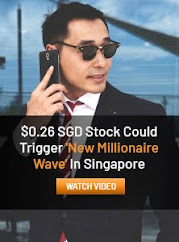 Perhaps you can check with SCBB? I neglected to ask about this during my consultation session with them as I had assumed it would be free since technically donating is a good deed. Doesn't make sense to charge donors leh. I only know that for the private, some charge, some don't. A close friend of mine donated her baby's cord blood. Her child had a diagnosis and when she checked with SCBB, the cord blood was discarded! She donated because its free, its for a good cause and might be given priority should the need arise. Unfortunately, it was thrown away and no acknowledgement or update was given.